If you would like to sponsor any other amount please just change the £2 to whatever you like or visit www.justgiving.com/lifeasawidower to do it online. Thanks so much. Jackson you and your mummy look beautiful! Good luck tomorrow Ben I hope you really enjoy the occasion. You should be incredibly proud of how you are converting your own pain in to help for others. My money is where my mouth is in the just giving pot! 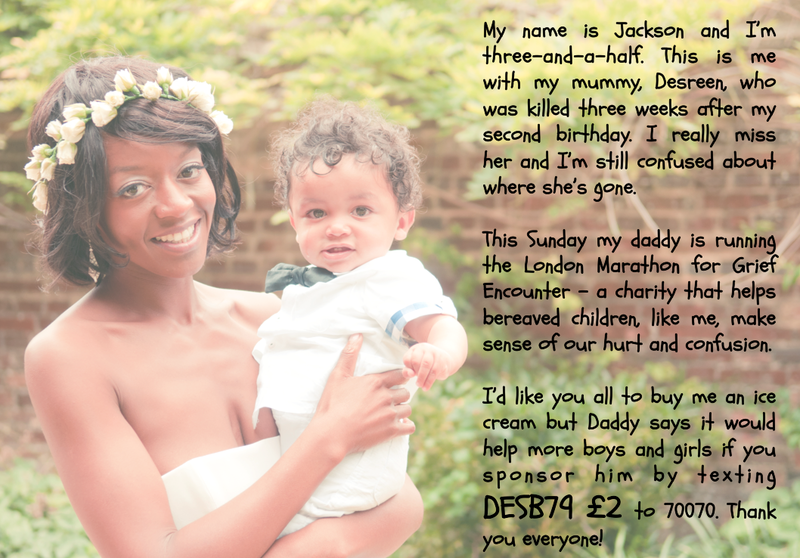 This entry was posted on April 10, 2014 by Ben Brooks-Dutton and tagged child bereavement, child bereavement support, children, Desreen Brooks, Grief Encounter, kids, life as a widower, lifeasawidower, London marathon.